From July, 2007: Huell Howser took a visit to Blooms General Store in the Arts District, after the passing of Joel Bloom. Howser's gift was not just finding stories, but connecting with people who understood the stories of their neighborhoods. The longtime host of KCET series "California's Gold," died last night of natural causes. He was 67. ADD: My post on Huell at KCET. KCET has a list of Huell tributes. Downtown Vid Pick: "Never Will Be Mine"
On the day that has a street fair in Joel Bloom Square, an appropriate Downtown Vid Pick is the recently released video for Rye Rye's hip-hop single “Never Will Be Mine." She and guest, Swedish pop star Robyn, take full advantage of the current street art around Traction, East 3rd, and Hewitt. The annual block party that honors an Arts District pioneer––held in the “square” named in his honor––has grown from a neighborhood memorial to a fully loaded art and music festival. That is not a bad thing. On Saturday, July 23, BloomfestLA will do what Joel Bloom did since he first arrived in Downtown LA in 1986, and until death in July, 2007; loudly showcase the Arts District. Shuttered Bloom's General Store To Once Again Serve Arts District, But With New Name. The space that once held Bloom's will reopen as a different general store and be named after the Arts District street corner it sits on. Photo by Charlie Wright. Vivian Um moved to the Arts District neighborhood and fell in love with it so much, she decided to open a small business to make life easier for locals; a small convenience market in what used to be Bloom’s General Store. She and her partners planned to call it “Little Tokyo Shopette” and use a pink and white candy themed interior. You can imagine how the natives became restless over that concept. 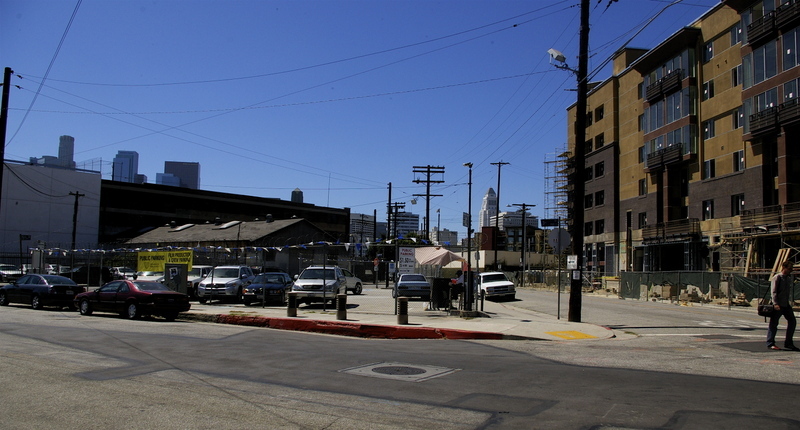 Hat Tips: Arturo Gonzalez from Councilmember Jose Huizar's office nudged DWP to check the address of the Downtown Arts District Dog Park. What do ya know? There was a dormant waterline and terminal. It has been activiated and thanks to local plumber Greg Robledo, the Arts District pup place will soon have water and a drinking fountain. "All we need is a water meter, run the drain, and we can hook it up," says Robledo, who operates at 418 Molina, steps away from the park. The dog park willl remain open during the mini-dig to run a drain. Blog Roll Addition: Angel City Brewery is setting up their brew crew in the former Roebling & Sons building at Traction and Alameda. The favored local microbewery will be operating by February 2011, complete with a public tap room and event space. Backstory at blogdowntown. Roebling Factoid: John A. Roebling’s Sons Co. landmark project is The Brooklyn Bridge and opened their Los Angeles warehouse in 1913. The family business extended to the grandsons and one of them, Washington A. Roebling, II, was lost at sea at the age of 31 as a passenger on the Titanic. Blog Roll Add 2: Gourmet Pizza eatery Toddy G’s opened in October, next to Tony's, on 7th near Mateo. Fundraiser: Kujali's Winter Art Auction will auction original African art from the local art markets of Dar-es-Salaam, Tanzania Saturday, Dec. 4. Proceeds will go to directly to Kujali's launch of first free private boarding school in Mkuranga Tanzania for orphaned teenagers. The silent auction ends at 10pm. There is also will a raffle for a pair of Lakers tickets, plus parking. (Private Loft / 209 S Garey). Poketo will hold a warehouse sale Dec. 4 from 10am to 2pm with 40% to 75% on tees, tops, jackets and hoodies. "Come for the crazy sale, cupcakes, music" they say. Also on sale, tabletop and giftware, stationary, wallets, handbags, laptop cases, art prints, and home decor. (510 Hewitt St. Space 506 / Cash or CC). Jazz at Cafe Metropol: Helen Sung Band tonight at 8pm. Kathleen Grace Band Saturday at 8pm. ARTSHARE will present "The Circle," written by Tina Lifford, at the ArtShare Warehouse Theatre, Saturday, Dec. 4, at 3pm. PICS AND DRINKS: Cocktail reception for The Factory's 2010 Architectural Photography Show Saturday, Dec. 4, from 3 to 6pm. Show ends December 11. LAST NOT LEAST: It's the last weekend for "Crimes of the Heart" at East West Players. WHICH WAY? The sign for Joel Bloom Square was placed at 3rd and Traction hoping that the triangle would be someday be purchased by the City and made into public space. As seen last Sunday, the portion of Traction Ave in front of Bloom's General Store is a solid backup if current owners want to keep this triangle a parking lot. 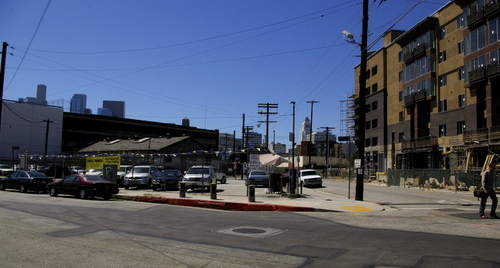 Dreamers move forward: Citizen LA is offering a competition for anyone to design this portion of the Arts District. While I've recently resisted work for spec because the promised exposure only leads to more work for spec, this one may be interesting to do as a project here. According to the press release, it's open to anyone interested. Details will be found in the August Issue of CitizenLA and a website will be up soon. Links and info will be added when they come, after the jump.